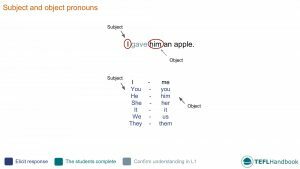 A collection of practical ESL activities and games for teaching the correct usage of subject and object pronouns. These resources can be used to form the basis of a lesson plan or to supplement an existing one. If you need to bring these materials into the classroom for reference, the TEFL Handbook app gives you offline access to all of the ESL resources on this site, plus a lot more. The board work below illustrates one way to introduce subject and object pronouns in the ESL classroom. Begin by writing a basic sentence on the board and eliciting the subject and object pronouns. 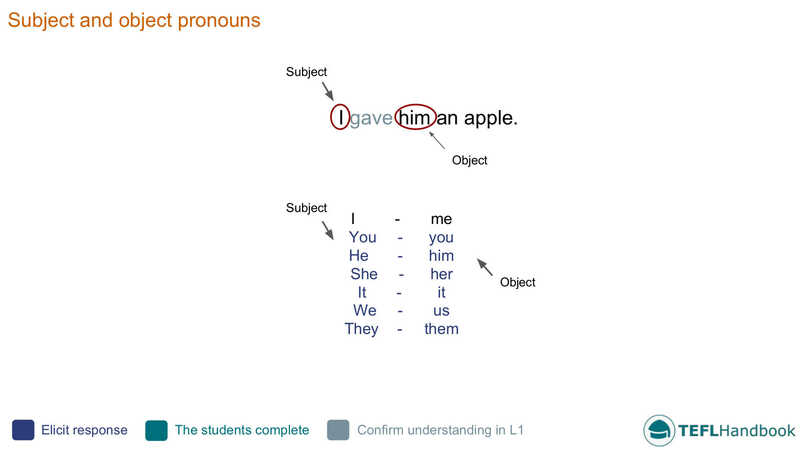 Then elicit a list of subject pronouns along with their corresponding object pronouns. 5. I hope they let _____ play, we’re the best players. When finished, they should compare their answers with a partner. 1. They gave them hamburgers. 2. He sold her a car. 3. She stole his football. 4. They listened to their song/band. 5. We ate their food. 6. I went to their party. If you've found these ideas useful, be sure to check out our complete list of ESL lesson plans for elementary level students, A2 lower and A2 upper. For other levels, see the entire collection of ESL lesson plans. Our suggested next lesson is on the past simple negative. Also, Android and iOS users can access all of our materials through the TEFL Handbook app. An ESL lesson planner for English teachers.